After being a significant part of the leather history in the Warmoesstraat for nearly 25 years, it is time for a change. 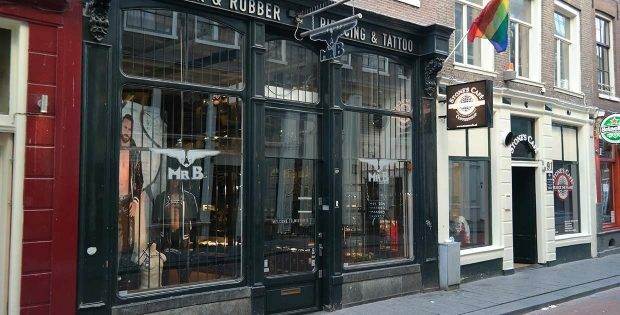 The Mister B flagship store is moving to a new location: Prinsengracht 192, right by the Homomonument and the Westerkerk. The Warmoesstraat has changed considerably over the past few years, mainly due to mass tourism. This combined with a building that no longer fit its needs, has led Mister B to the decision of moving to a new location, creating a wonderful opportunity for the brand to re-invent itself as well. “Our store became an attraction for many tourists, but mostly for the wrong reasons. Our customers didn’t always feel at ease with the hordes of tourists coming in, often laughing at what they saw. It is time for us to move to a location which allows us to focus solely on our customers, not the people coming in for their Instagram selfies”, says owner Nelson Sousa da Cunha. It is at the Warmoesstraat where Mister B developed its brand into the household name it is today in the gay and fetish scene worldwide. With brand stores in Amsterdam, Berlin and Antwerp, as well as concept stores in Copenhagen and Frankfurt, Mister B has come a long way in 25 years and is determined to continue for at least 25 more years. The inspiring new location is on the world famous Prinsengracht, just around the corner of the Homomonument, a special place for the gay community in Amsterdam and beyond. On August 26 the store at the Warmoesstraat will close its doors, the new Mister B flagship store will open at Prinsengracht 192 on September 1. Mister B invites everybody to come and have a look at the place where it will continue its legacy.